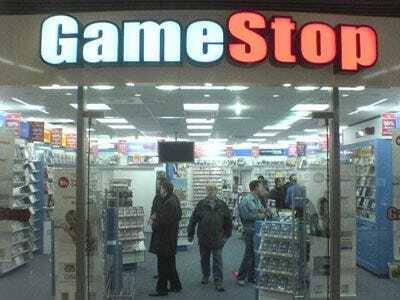 Is There A Deal In The Works For Gamestop? When the rumour began circulating earlier this week that Gamestop might be an acquisition target, we initially were sceptical. The stock rose 5.85% today. Volume on the options markets exploded. Even with Gamestop due to report earnings next week, this extraordinary activity seems to indicate that someone thinks there might be a deal in the works. Now there’s a bit more evidence of a possible deal. We spoke to Gamestop’s M&A lawyers at Bryan Cave LLP today, and they were very busy. The secretaries of two different attorneys who have worked on Gamestop M&A deals in the past told us the attorney we were calling was on a conference call. The phones of five others went directly to voicemail. One secretary put us on hold when we mentioned we were calling about “the Gamestop acquisition,” and it seemed from our conversation with her that she was familiar with a deal in progress. So the entire Gamestop M&A deal team at Bryan Cave seems to have been on a conference call at the same time. Of course, they could be working on a completely unrelated deal. Eventually, a partner at Bryan Cave called us back. We asked him for a comment on the Gamestop acquisition. “I cannot really comment on that,” he said. Not a lot to go on, we know. But if you read between the lines, it is at least suggestive.